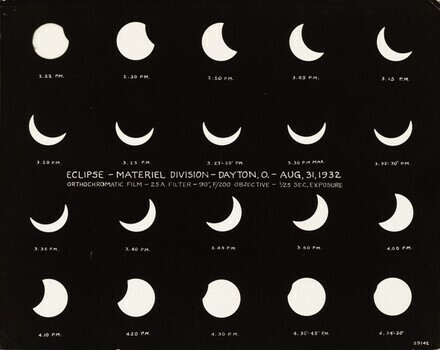 by unknown hand, across center in negative: ECLIPSE--MATERIEL DIVISION--DAYTON, O. -- AUG, 31, 1932 / ORTHOCHROMATIC FILM-- 25 A FILTER-- 90", F/200 OBJECTIVE--1/25 SEC. EXPOSURE; timestamp under each moon in negative; bottom right in negative: 59142.